Home Costs > How Much Does a Garbage Disposal Cost? 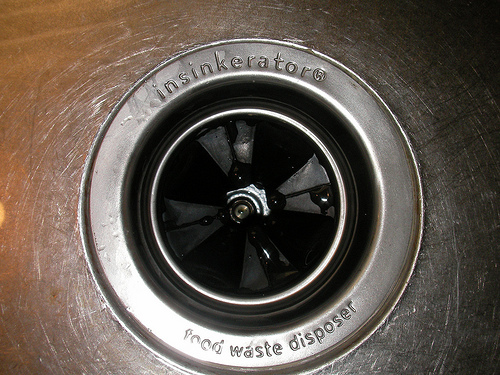 If you wish to cut down on the amount of food you put in your garbage, buying a garbage disposal can help. Instead of having to scrape extra food into the trash, which can attract bugs and cause a foul odor, you can scrape it into your sink and dispose of it down the drain. A garbage disposal, without installation, can cost $100 to $300. When the installation is factored in, you will want to add another $100 to $200 to the price. The price will depend mostly on the size of the motor and the type. Most motors will be 1/3, 1/2, 3/4 or one horsepower. The larger the motor, the more expensive the disposal will be. Typically, a garbage disposal with a 1/3 hp motor will cost around $50 to $100. A disposal that is slightly more powerful with a 3/4 hp motor will cost around $130 to $300. Also, an aluminum disposal, which is considered to more economical, can cost $70 to $150, while a stainless steel version, which won’t dull, can cost $175 to $300. The Waste King L-2600 with a 1/2 horsepower motor, for example, will cost $80 to $160. The Waste King also has the L-8000, which has a one horsepower motor can cost anywhere from $125 to $300. The highly rated InSinkErator Evolution has a 3/4 horsepower food waste disposer and can cost anywhere from $180 to $325. Commercial grade disposals designed for restaurants or for heavy use can cost upwards of $600 to $1,500. This will all depend on the horsepower of the motor. There are two types of disposals on the market. One is a continuous feed, which will run via a wall switch. As long as the switch is on, the disposal will continue to run; this will be your cheapest option. The other type, known as a batch feed, will run once a cover is placed on top. While slower, this tends to be the safest option. Most garbage disposals will come with a limited warranty and will depend on the brand you buy. How long does a garbage disposal last? On average, it will depend on the blades, brand and how often you use it. Most disposals should last 10 to 15 years. If you would like to get the garbage disposal professionally installed, this will be an extra charge. Most companies will charge per hour for this service, and it shouldn’t take longer than two hours to perform the job. Big box retailers such as Home Depot and Lowe’s offer professional installation if you purchase the disposal through their store. Whether you go to a home improvement store or a local handyman, the labor costs will be about $100 to $250. Newer disposals may require a new wiring setup, and if you don’t have the wiring in place, it could cost an additional $100 to $150 to have a new ground outlet installed. While the ground outlet will be cheap and easy to install, you’re paying mostly for the electrician’s time. Other accessories may be needed such as adding a dishwasher drain connector or a baffle to protect your silverware. If you purchase your garbage disposal online, you may have to pay extra for shipping. Cleaning will be required on a monthly basis to make sure it runs properly. Smaller tablets can be placed in the disposal to break up any buildup and keep it smelling fresh. A pack of garbage disposal cleaning tablets will cost about $5. Over time, the blades within the garbage disposal will begin to dull. A great way to help keep the teeth sharp is by grinding ice each month. Always make sure that you run water before the disposal is on and afterward. Failing to do so can lead to malfunctions. The water will help lubricate the teeth inside of the disposal while it’s running. Never put food that can expand down your drain such as rice or potatoes. It’s also best to avoid sending fat down the drain as well since each of these can easily clog a drain, causing more damage. Research the warranty that comes with the disposal. This will usually indicate how good of a product it is. Great companies are more than happy to back up their product for years. If you’re on a septic system, it’s best to purchase a disposal that will work with it. There are disposals on the market that are designed specifically for septic systems. A 1/3 to 1/2 horsepower garbage disposal is ideal for those who have a family of four. For anything larger, it’s recommended that you shop for something more powerful than a half of horsepower. You may not need a new garbage disposal just yet. If yours stopped working, look for a little red button on the side of your disposal and press it. By doing so, this will reset your disposal since it has an overload protection feature, which goes into effect when it becomes jammed or overloaded. As stated above, there are two types of disposals: the continuous feed and batch feed. Do you want to turn on a switch to use yours or do you want to place a cover on top to activate it? Continuous feeds are the most common type of disposal found in households. Look at the horsepower ratings above and decide which one suits your household. If you want to play it safe, it’s highly recommended you get one that’s rated at one horsepower. This much power will ensure your disposal is powerful, and it won’t clog your drain. Plus, it will often be made of stainless steel, which means it won’t rust easily. Garbage disposals are known to be noisy, so make sure you look at the noise-reduction features. Most of your newer models will use noise-dampening material that helps reduce the rumbling. Stainless steel parts won’t corrode and can help you avoid unnecessary repairs in the future. The number will depend on the number of people who live in your home and the amount of food you plan on throwing down the drain daily. As mentioned above, there are four primary horsepower types: 1/3, 1/2, 1/4 and one. A 1/3 horsepower disposal is ideal for one or two people living in the home and is known for its lower power. This disposal will do well with softer foods, but it will jam a lot more than its higher powered counterparts. Also, most of the 1/3 horsepower will be made of aluminum, which means it will be prone to rust. A 1/2 horsepower disposal will be ideal for one to two people and will be a pinch more powerful than a 1/3 horsepower disposal. Most of these disposals will cost less than $100 and will be geared toward those who are looking for an economical option. To make sure it lasts longer, be sure to choose one with stainless steel blades. A 3/4 powered disposal will be one of the most powerful disposals you can purchase for your home and is ideal for a larger family. These tend to be found in most households and can be the quietest types on the market. Lastly, a one horsepower disposal will be the most powerful option on the market. This disposal can grind just about anything, including bones. With a plethora of options, most come equipped with stainless steel blades and will be quieter than most. Only buy the size motor you actually need. Most household kitchens are fine with the smaller 1/3 horsepower disposal. If you’re unsure of the size or the power you need, check the older disposal that’s currently under your sink. Install the garbage disposal yourself to save on installation costs. There are many tutorials available online showing you how to install a disposal. Unless you know what you’re doing, most recommend paying the additional $100 to make sure the job is done right. While it may be tempting to purchase a cheaper unit, you may want to think again. Cheaper units tend to be louder, will require more water and can clog easier. Expensive models, on the other hand, can grind faster, will be quieter and can come with a longer warranty. Most garbage disposal repair jobs won’t be worth it and you will probably be better off investing in a new one.